Otavalo is about an hour's drive north of Quito; one reason it is among the most popular towns for tourists to visit. It has a busy market filled with a wide range of well-made handicrafts, mostly woven goods. Market shopping can work up an appetite! So there are numerous vendors selling food on the streets around Otavalo market. 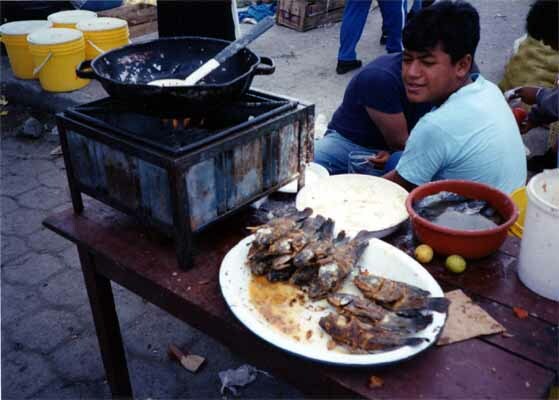 Here is a man selling freshly cooked fish. 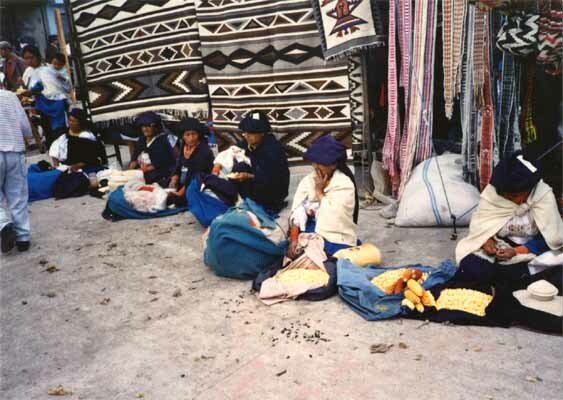 Women of Otavalo dress in characteristically traditional garb comprised of a blue skirt, a shawl and felt headgear, usually a hat. They do much of the buying and selling at market and make many of the handicrafts such as woven rugs.